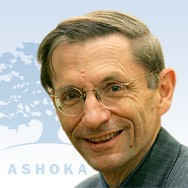 Bill Drayton, founder of Ashoka, has been bestowed with the 2011 Prince of Asturias Award for International Cooperation. The Jury for the Award announced its decision today in Oviedo. Driving force behind the figure of social entrepreneurs, men and women who undertake innovative initiatives for the common good, Bill Drayton has generated a platform of citizens who, via their projects, have changed the way of solving society’s problems. This candidature was put forward by Diego Hidalgo Schnur, president of FRIDE (Foundation for International Relations and Foreign Dialogue) and was seconded by Federico Mayor Zaragoza, president of the Foundation for a Culture of Peace. Bill Drayton (New York, 1943) studied at Harvard College, at Balliol College, Oxford and obtained his JD from Yale Law School in 1970. He commenced his professional career at McKinsey and Company in his hometown and, between 1977 and 1981, served as Assistant Administrator at the US Environmental Protection Agency (EPA). In 1981, while working part-time for McKinsey, he founded the organisations Ashoka: Innovators for the Public and Save EPA, the predecessor of Environmental Safety. In 1984, he was named MacArthur Fellow by the foundation of the same name and this economic support allowed him to devote himself in full to Ashoka, of which he is currently both Chair and CEO. He also chairs other social initiatives such as Youth Venture, Community Greens and Get America Working! Since his student days, Drayton has been involved in numerous initiatives aimed at procuring the social improvement of his environment. Strongly influenced by the thinking of Martin Luther King and Gandhi, as well as by the figure of the 3rd century BC Indian emperor Ashoka, Drayton started up a support network for social entrepreneurs travelling to different towns and cities in India and Indonesia in the mid-80’s with the aim of building a network of advocates and of drawing up a reliable process for selecting these entrepreneurs. Thus came into being Ashoka: Innovators for the Public, which has become the largest social entrepreneurs association in the world, in which men and women provide solutions for the planet’s most pressing problems. Since its founding, Ashoka has provided seed funding, professional support services and access to a global network of more than 3,000 leading entrepreneurs –chosen as Ashoka Fellows– in over seventy countries. Drayton then coined the term “social entrepreneur” to describe those individuals who combine the pragmatic goal-oriented methods of business with the aims of a social reformer. The fundamental idea on which Ashoka is based is that the challenges of society need each person to be able to be a changemaker, from any setting, whether global or local. Starting out from the belief that each individual has the basic goodness, capacity and responsibility to contribute to the necessary solutions, Ashoka employs a rigorous selection process to choose these social entrepreneurs through the exhaustive examination of their projects for innovation and change, their potential impact and their motivation and ethical character. Holder of an honorary doctorate from University of Yale and member of the American Academy of Arts and Sciences and of the US National Academy of Public Administration, among others, Bill Drayton has received various distinctions, such as the National Public Service Award (1995), the Skoll Award for Social Entrepreneurship (USA, 2005), the Yale Law School Award of Merit (2005), the Peace Award of the Goi Peace Foundation (Japan, 2007), the Universal Peace Award of the World Association of Non-Governmental Organizations (2009) and the Essl Social Prize (Austria, 2010). According to the Statutes of the Foundation, the Prince of Asturias Awards aim “to reward the scientific, technical, cultural, social and humanistic work performed at an international level by individuals, institutions or groups of individuals or institutions”. As part of this spirit those “whose work has contributed in both an exemplary and relevant way to mutual understanding, progress or fellowship among peoples” may be nominated for the Prince of Asturias Award for International Cooperation. This year a total of 25 candidatures from Algeria, Brazil, Chile, Germany, India, Israel, Italy, Japan, Jordan, Kenya, Lebanon, Palestine, Panama, Portugal, Sweden, United Kingdom, United States, and Spain ran for the award. This is the sixth of eight Prince of Asturias Awards to be bestowed this year for the thirty first time. The Prince of Asturias Award for the Arts went to Italian conductor Riccardo Muti, the Prince of Asturias Award for Social Sciences was given to US psychologist Howard Gardner, the Prince of Asturias Award for Communication and Humanities went to British institution The Royal Society, the Prince of Asturias Award for Technical and Scientific Research was jointly bestowed on neuroscientists Joseph Altman, Arturo Álvarez-Buylla and Giacomo Rizzolatti, and the Prince of Asturias Award for Literature was given to Leonard Cohen. The Prince of Asturias Awards for Sports and Concord will be announced in September.